Fugitive in Siemens bribe case shows up in Dhaka but will he serve 30 years? 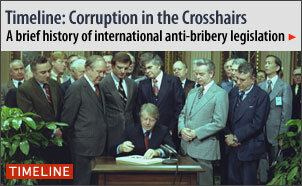 Global watchdog working to combat international corruption. Blog tracking corruption trends, also publishes a "Grand Corruption Watch List". Currently based in Cambodia, David Montero is a regular contributor to FRONTLINE/World reporting from across South Asia. Watch "A Death in Swat," his most recent report from Pakistan. When Siemens spent $5million bribing the Bangladesh government in 2004 to secure a mobile phone contract, one of the beneficiaries was Aminul Haque, the country's telecommunications minister. Rather than face 31 years in jail, Haque went on the run. It turned out the minister was not only taking kickbacks in office but patronizing one of the country's most violent extremist group, Jamat'ul Mujahadeen Bangladesh, or JMB, an Islamic group responsible for scores of political killings, many of them in Haque's home constituency of Rajshahi in the north. While investigating Haque's connections to JMB earlier this year, reporter David Montero traveled to Rajshahi where villagers told him that they had been tortured by the militants and family members killed simply because they belonged to JMB's political opposition. David Montero (left) with the Daily Star's Julfikar Ali Manik. Although no one has established that Haque used his Siemens bribe payments to directly support the militants, his patronage brings home some of the dismal consequences of doing graft in one of the poorest, most corrupt countries in the world. In December, Siemens was fined a record $1.6 billion for violating the Foreign Corrupt Practices Act in an audacious web of corruption that spanned the globe, including Bangladesh. After the settlement, acting U.S. Assistant Attorney General Mathew Friedrich reminded corporations of the real costs of their actions: "Corruption is not a gentleman's agreement where no one gets hurt. People do get hurt," he said in a press conference. "And the people who get hurt the worst are often residents of the poorest countries on the face of the earth." The story took a new twist this summer when Haque turned himself in at a Dhaka courtroom after more than two years on the lam. Figuring out what the next chapter is in this convoluted story and why Haque would surrender now while still facing 30 years in prison, Montero talked over webcam with Julfikar Ali Manik, a journalist who has been following the case for Bangladesh's leading English-language newspaper, The Daily Star. Corruption is a depressing fact of life but thank you Frontline for continuing to shine a light on what it does to poor countries and the hypocrisy of the West in feeding much of it. If it weren't Siemens bribing it would be some other multinational. It's ironic that even when these corporations are prosecuted, all they do is buy their way out of the problem. I commend the journalist in Bangladesh for reporting on his country's corrupt officials and wonder whether the Bangladesh government will show as much conviction now that the offending minister is back in their custody. This reporting contains factual materials about two not unimportant practitioners of one case of corruption -- a minister in a third world country, and a major company from a first world country -- a corrupt receiver and a corrupt perpetrator of bribery. Unfortunately, it fails to avoid the cliche ridden lingo and tone of weak journalism, such as while the recipient of the bribe is from a "most corrupt" third world country, the perpetrator is an "audacious" company from a first world country. Well, the corrupt minister too has surrendered to the court -- he is not above the law of his country. Without disputing the large number of petty corruptions in the third world countries, that brings their citizen in large numbers to rightly express their disgust about corruption in public opinion surveys, one may assume, unless proven otherwise by the researches of the "corruption watching" institutions, that the financial VOLUME of corruption practiced by the first world companies far exceeds the volume of third world indigenous corruption. Unless the reporters on corruption alter their cliche ridden mind-set about third world and corruption, the global problem of corruption would hardly be rightly perceived, let alone be overcome.